Whether you are moving a business across the country or taking your family to a larger home in the local region, working with a professional San Joaquin County moving company can make all the difference in having a pleasant, stress-free experience. Since 1891, Mid Cal Moving & Storage has been the premier provider of streamlined moving solutions throughout the area, and our ProMover-certified team of Stockton movers is here to ensure that you get the most out of the relocation process. Residential Moving: From packing your home to providing seamless, secure transport, we cover the full scope of all residential moving needs. Commercial Moving: Our expert Stockton movers work within your company’s parameters to minimize the downtime of your business during relocation. International Moving: Our comprehensive international moving services cover all of your relocation needs to ensure a timely, stress-free process. Specialized Moving: When you’re in need of specialized moving services, there is no better choice than our Mid Cal moving company. Storage Services: By offering both short- and long-term storage plans, you can feel confident knowing your items are safe in our fully secured storage facilities. Get a Free Price Quote Today for Your Upcoming Move in San Joaquin County, CA! 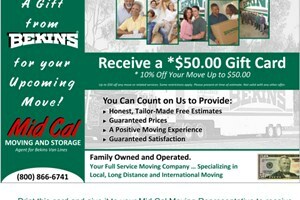 As a top-rated San Joaquin County moving company, Mid Cal Moving & Storage is here to ensure that you get the most out of your upcoming household or business move—without spending a fortune! Learn more about our premier moving and storage services today by giving us a call to speak with one of our friendly relocation experts, or fill out our brief, online form now to request an appointment for your free, no-obligation estimate.